Control Your Seed. Control Your Farm. 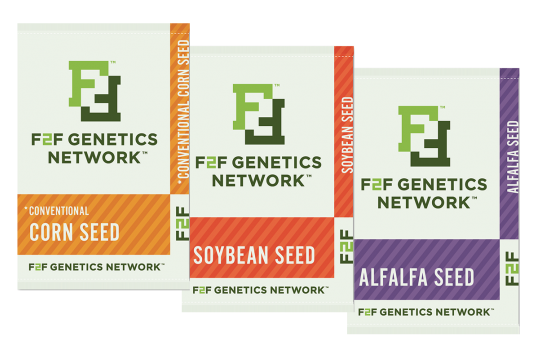 The F2F Genetics Network was created to bring farmers radical innovation, transparency and economics through an entirely new model for seed development and purchasing. In the F2F℠ farmer-breeder network, your feedback will drive new products for your farm. You're planting great seed and shaping the future of the seed industry - Farmers First℠. We believe you should get great prices no matter how many acres you farm or where you live. Our national, transparent pricing eliminates discriminatory regional zone pricing and hidden discounts that hurt family farm incomes. So we put our best offer forward, every time, right up front - available to all FBN members. With F2F seeds, the price is the price. With the F2F Unbundle, restrictive bundles are eliminated with flexible financing and discounts on other inputs in FBN Direct™. Being independent and sourcing our own seed also gives us the freedom to do things differently. We created F2F with a clean slate after hearing the seed challenges of our thousands of FBN members. So we don't have to be bound by the same restrictions that limited other seed companies. We can help breeders release more products to increase competition for your seed dollar. We can let you buy direct online. We can have national pricing. We can list prices transparently. We can put R&D emphasis on conventional, un-traited seeds that big seed companies ignore so they can sell expensive trait packages. We can utilize post-patent traits. We can let you use field-performance data to directly influence the breeding and production decisions of the F2F network. In short, we can put you in the driver's seat of the seed industry. Ultimately, it's not the price that matters, but the total Return on Investment (ROI) of your seed dollar, and your net income per acre. Great yields should come at affordable prices. F2F℠ seeds are uncompromising on performance. You shouldn't have to choosing between high yields and affordable seed prices. You can have both. By creating a breeder-direct network, F2F is able to access premier genetics but deliver them in a vastly lower cost way, passing the savings directly to you. That's the beauty of being a truly Farmers First system. In year one, we'll share the performance and attribute information we have from breeder trials and production field yields. But as F2F seeds are grown nationwide, you'll be able to see exactly how seeds are performing on hundreds of thousands of acres under real-life conditions. And through the power of the FBN analytics system, we can help optimize your placement. FBN analytics has now processed over 160 million acre-events of precision data. We've analyzed thousands of seeds in literally millions of combinations of soil, population, fertility, pest & disease management, weather, rotation, and tillage. Effectively, the FBN analytics system turns the entire farm belt into one large test plot. The power of that system can be brought to bear not only for precise hybrid placement and field selection, but also population, rotation, fertility and tillage management. You should be able to keep soybean seed. Period. We believe in providing options and value to farmers in any way we can. The Soy+1 program gives farmers the option to hold back seed for one additional planting and harvest season. We're bringing you total transparency on price, yield performance, and genetic identity. Price Transparency: Our national, transparent pricing eliminates discriminatory regional zone pricing and hidden discounts that hurt family farm incomes. So we put our best offer forward, every time, right up front - available to all FBN members. Yield Transparency: It's one thing for a seed to do well in a trial, does it actually perform on a real farm? Not only will we provide transparency on breeder trial performance, but through FBN Seed Finder, you'll see just how well F2F seeds are yielding in your area. If a seed isn't performing, you'll see that too. Maximum seed success means getting the right seeds on the right soils, so we work with you to optimize placement. Genetic Transparency: Lastly, you should know the genetics of what you're planting, before you buy. As the FBN Seed Relabeling Report found, seed brands can obscure the true identity of their seeds and charge wildly different prices. And even if a seed is not directly relabeled, it can share parents of other seeds you're planting, creating genetic risk in your crop. We will provide genetic transparency on lineage and identity up front, on the product sheet, before you buy. If a seed is relabeled, we'll show you which seeds it matches. If seeds have common parents, we'll show you that as well. Overpaying for seed or accidentally duplicating genetics because of the lack of transparency shouldn't happen. With F2F seeds, it won't. The F2F Genetics Network works with premier independent breeders and universities to select and produce top performing genetics. We believe you shouldn't have to compromise performance, transparency or fair prices. ** Updated with 2018 harvest data. Get above ground insect control, below ground insect control, and herbicide tolerance with Master Farmer seed distributed through the F2F Genetics Network. See which Master Farmer seed varieties are sold under other brand names and make seed relabeling work for you with our Master Farmer "Also Sold As" Varieties sheet. Grain Sorghum, Forage Sorghum, and Sudangrass, offered direct to farmers at a great price! Sorghum from Warner Seeds, Inc. Farmers who show a strong commitment to the vision of F2F Genetics with a 500 acre planting commitment are eligible for early season pricing and an Unbundle Coupon on chemicals purchased through FBN Direct. We believe in providing options and value to farmers in any way we can. The Soy+1 program gives farmers the option to hold back seed for one additional planting and harvest season. * We'll help with genetic purity and germination testing along with seed treatment. *Additional terms & conditions apply and are subject to change. Would You Like to Be A Farmer Dealer?